Swarming is part of the natural reproductive life cycle of honey bees. The swarming season is usually between September and December but on rare occasions colonies may swarm at other times. Warmer weather, combined with an abundance of nectar and pollen, stimulate the colony to increase in population. Overcrowding in the hive can prompt some bees to swarm – they leave the parent colony so that they can reproduce by starting a new colony elsewhere. The old queen is put on hard rations for a few days (to reduce her body weight, allowing her to fly, albeit sluggishly – she is often ‘supported’ in flight by the worker bees while swarming occurs), then together with about half of the bees from the colony, leaves the hive and they cluster on a nearby object such as a fence or a small shrub. This usually occurs sometime around midday - 10:00am to 2:00pm. The swarm may remain for a few hours or 1–2 days while scout bees (worker bees) search for a permanent nesting site. Once found, the swarm will move to this site and establish a new colony. The question of how the bees decide where to go to start their new colony has been well-researched by Tom Seeley, and is worthy of an article in itself. Swarms are not normally aggressive on emerging from the hive, because the bees have engorged on honey prior to setting out for their new home – this provides them with the energy they need to locate and fly to the new site, and to then commence the building of honeycomb in which the queen can proceed to lay eggs. The public perception however, is that swarms are going to be aggressive. Surely so many bees milling about, and making such a loud noise, have to be aggressive? 1. The public perception issue (above). This perception may be proven right in time, as a swarm will become increasingly defensive, if provoked, the longer it remains in a given location. 2. The loss of approximately half the hive strength means a time lapse occurs in building of nectar stores. Hives that produce swarms produce less honey! Many of the bees which just vacated are the older field bees, needed to forage for food and pollen to feed the new brood nest. Younger bees are also needed to build the comb – there is no brood to look after at the start, only the queen. A small force of young bees can nurse the starting brood nest until new bees hatch to assist the development of the brood area. 3. The old hive is left at risk. Before the swarm emerges, queen cells have been started to allow for replacement of the old queen with a new one. But before the survival of the now-depleted parent colony is assured, the new queen has to match, mate successfully, and then find her way back to her colony. All three steps are fraught with danger; she may succumb to a virus or other factor and not even hatch; she may mate, but with drones of dubious genetic background or that are few in number; or she may get lost or taken by a predatory bird on her return flight to the hive! 4. Swarms can settle in and colonise awkward places – high in a tree, from where they can only be collected with difficulty and a certain amount of risk; in very public places; or in roof/wall cavities, in which they can then build extensive nests, posing future problems for the homeowner. 5. Swarming from the parent colony does not always stop with the first, or ‘prime’, swarm. There may be a later succession of smaller, ‘after’ swarms, some only containing newly-emerged virgin queens, and each further depleting the parent colony. After-swarms are extremely difficult to hive, and are often so small that their survival through the next winter is doubtful. 6. The swarming event is actually risky for the bees. Only about 50% will result in successful colonies that survive their first winter. The swarm queen is under pressure to lay eggs as soon as the new cells are each about 1/3 completed, and already a year old, is soon worn old. At some unknown stage in the brood cycle she will be superseded, again introducing the uncertainty factor of the need to successfully mate and return to ensure continuance of the swarm colony. When Will the Swarm Emerge? This will largely depend upon the season. In warmer areas, brood production may occur right through winter – the more brood that is carried through winter, the more quickly the hive will build in the Spring. Most beekeepers today will be aware that it is not the single Queen bee that is the reproductive unit – it is the entire colony, now often regarded as a ‘super-organism’. In the wild, ‘feral’ bees will go through cycles of build-up and depletion. Favourable nest sites will sometimes fall vacant, or will be re-colonised. Rarely will such sites be continually occupied for years. Managed colonies, however, have trained their beekeeper to maintain them. The beekeeper ensures the strength and health of the colony are maintained in a way that is not open to the feral hive. Genetics also plays a role – some races of bees are more inclined to swarm than others. Italian bees (Apis mellifera ligustica), are possibly the least likely to swarm, and are the most popular race in Australia because of their high honey production, reduced swarming and high levels of brood production. Caucasian bees (Apis mellifera caucasica) are more likely to swarm, but less so than Carniolan bees (Apis mellifera carnica), popular throughout Europe for their gentleness, which are more likely to swarm. The original German Black bee (Apis mellifera mellifera) is a popular bee in colder areas of Europe, and the Buckfast bee ( a hybrid developed by Brother Adam, and whose progeny includes salvaged remnants of the British black bee), are also less likely to swarm. The most notorious of all is Apis scutellata, the African bee, a different species to the European bee races. Not only is it more defensive (so more likely to attack intruders) – it also swarms more readily, and over greater distances. The Africanised bee – a hybrid between scutellata and ligustica – is even more defensive, and more likely to swarm, which is why it has been such a problem in its spread from Brazil to the US. It is, however, the state of the queen, and the interaction between the queen and her colony, within the expanding colony and confined by the available space, that drives the swarm impulse. This gives us, the beekeepers, guidance as to how we can ‘control’ (reduce) swarming and manage it within our hives. Queen bees produce chemicals. These are called pheromones, and the chemicals are picked up by the nurse bees as they feed the queen. The pheromones are then distributed amongst the other bees in the hive, including the field bees. These substances not only tell the bees in the hive that the queen is active – they also suppress ovary development in the worker bees (and thus egg-laying by the workers). As the queen ages, her production of the pheromone decreases – to the point where some bees will recognise that the queen is aging and will attempt to replace her by building ‘supersedure’ cells and having the queen lay her own replacement in these cells, each of which will then be raised by the workers so that a new queen can emerge and ‘take control’. Overcrowding in the hive colony can achieve the same result – the bees become less efficient at passing the pheromone around, and the queen herself is not as free to roam, further decreasing the spread of her control ‘pheromone’ around the hive. Increasing nectar availability can increase the problem, as the bees can sometimes start storing honey in the brood nest, thus restricting the space available to the queen in which to lay her eggs. All of this can then be interpreted by the bees as a ‘failing queen’. Ignoring their mistake, the result is the same – the workers make queen cells, the queen lays eggs in them, and the colony swarms, some of the bees taking the old queen with them just prior to the emergence of any virgins from the queen cells. This is also the reason that older queens are more likely to swarm – not only are they running out of stored sperm in their spermatheca, they are also producing less pheromone. It is necessary at this point to distinguish between ‘Swarm control’, Swarm prevention’, and ‘Swarm management’. Swarm management includes those things we do after the hive has swarmed. Ensure you have selected a race of bees that suits your needs. Ensure that your bees are headed in Spring by a young queen. The reason a lot of beekeepers like Autumn queens is that they are well-mated (there is usually a greater number of sexually-mature drones available for mating) and they are young enough to reduce the risk of swarming in Spring. NOTE:while plastic foundation is easier to assemble, bees are generally reluctant to draw the comb unless conditions are good, in which case the frames might have to be drawn in a honey super, extracted, and then placed in the brood nest. Plastic foundation also reduces the number of drone cells in the hive – not necessarily a good thing. We need drones – they mate with the virgin queens – a total absence of drones is NOT a good thing. Assuming you are using a queen excluder, when putting the frames of foundation in the brood box, ensure the queen is left downstairs. Shake the bees off the frame if you can’t find the queen. The best two frames to remove are the ‘wall’ frames to the outsides of the box. They are more likely to be full of honey and pollen, so you are effectively giving the queen even more room to lay eggs. In a really good season, it does not hurt to repeat the last steps after a couple of weeks – adding more frames (foundation or drawn, doesn’t matter) to the brood box. If some brood is ‘moved’ upstairs in the process, that is OK. Nurse bees will be able to move upstairs to care for any larvae. The queen is good, the hive has lots of space, and they still want to make queen cells! If these are clustered to the edges of the frame or brood nest, they are more likely to be ‘swarm cells’ Cells for supersedure are fewer in number, bigger, usually more central on the frame, and more well-cared-for. Prior to building queen cells, the bees will usually build ‘queen cups’ – these look like acorn hats. You can tear them down, but you are wasting your time, and they don’t really influence anything. It is only when you find eggs and royal jelly in the cups, and when the bees start to enlarge the cells, that they are likely to swarm – sometimes as soon as the queen cells are capped. At this point the bees are committed to swarming. Tearing the queen cells down (using you hive tool to cut them out) will usually not help long-term; and it is necessary to check every 7 to 8 days to make sure you get the repeat ones. A Carniolan hive in Germany. With no excluder, the queen is mostly laying eggs upstairs, so it is possible to quickly check from underneath for the presence of swarm cells. Each box can be checked this way – not foolproof, but efficient. A better idea might be to split the hive. Find the old queen, move her, the parent hive, and the frames of brood without cells complete with bees to a new site about a metre away. Face it in a slightly different position. Put the new hive, complete with the frames containing cells and the bees on those frames, in the old position. Most of the old field bees will fly out of the old hive (in the new position) and return to the new hive (in the old position). You have made an artificial swarm. If the new queen does not successfully mate, you can always reunite the two hives later. This is also called the Pagden method, but can often fail if the conditions are not good. This could also be done before the appearance of swarm cells, in which case it would be a control method! Despite all your good work, you get a phone call or arrive home to find your bees in a tree! All is not lost – a swarm is easily hived, or at least, it is if you can reach it! Wait until a cluster has formed or is forming. Assuming you are NOT standing on the top step of a stepladder, place a bottom box under the swarm having first removed half the frames from the centre. Don’t use sticky frames – the bees are already engorged with honey and have trouble cleaning up stickies. Give the branch a shark knock, and the cluster of bees will fall into the box. Replace the frames, letting them settle slowly into the mass of bees at the bottom of the frame – forcing them in too fast may kill the queen! Including 2 or even 4 frames of foundation at this stage will not hurt. Swarm bees display a prodigious ability to build good, white comb. Moving the swarm a few kilometres away after collection will sometimes help to keep them in the box, but I have usually tried to leave the box close to where the cluster originally formed. This usually seems to work best if the swarm has been caught soon after emergence, before the ‘scouts’ have set up their social discussion on where is best to move. 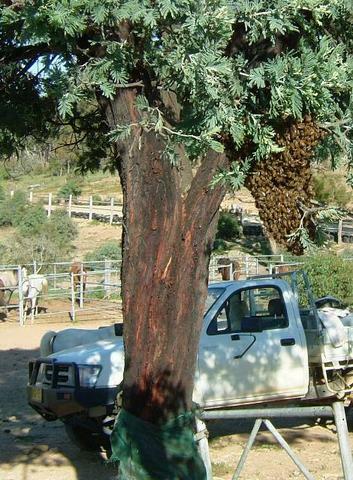 Not an easy swarm to hive – it is clustered around the trunk of the tree. It will probably be possible to collect bes on a frame or two, and to then induce the bees to ‘walk’ into the hive brood box. If the swarm is on the ground, or clinging to a wall, a piece of cardboard will work to scrape them off, or holding an empty comb against the cluster will allow bees to cling to the frame. Once the frame is put in the box, the bees will soon line up on the doorstep and fan outwards, blowing scent into the breeze to attract their fellow bees inside. Watching onlookers will be amazed at your training skills! I have collected bee swarms in buckets and in cardboard boxes; even in motorcycle pannier bags, before fixing them to the motorbike for a 20km trip home to hive them without problems. There is one other method to catch swarms. Experienced beekeepers are aware that swarms will often cluster on the same spot year after year. A scent (pheromone?) is left behind. One year I collected 4 swarms from the same fence post next to my own apiary at Stockinbingal. The next year I caught another 3 from the same fence post. The same two years, at another site, I collected at least 3 swarms each year from the same fence post. (Fence posts do, after all, often have splits in them, which would allow colonisation by a swarm.) I then imported some artificial queen bee pheromone from Canada, and used the vials in Bait hives at both sites, and successfully caught a number of swarms each year at both sites without having to do any real work. By then, however, I was also starting to very successfully practise the methods of swarm control described earlier, and now feel I have a good handle on swarm control. There is a separate article on bait hives in this Issue. This is just as important as anything mentioned earlier. The parent hive has been denuded of bees, and needs attention, and the collected swarm also needs to be built up as quickly as possible – else neither will yield an excess of honey for the beekeeper, let alone to ensure their survival next winter. But this necessity is worthy of an article in itself. Of equal importance, and for the reason that the swarm contains an old queen (see point 6 above) is the need to consider re-queening the collected swarm as soon as possible. This will avoid the possibility of the colony superseding the queen, and will also avoid propagating the genetic traits that made it liable to swarming in the first place. This also avoids the time delay introduced into the brood cycle (about 3 weeks) waiting for a supersedure queen to mate and start laying. Rankmore, M. NSW DPI PRIMEFACT 93 SECOND EDITION APRIL 2009 Bee swarms – what to do?